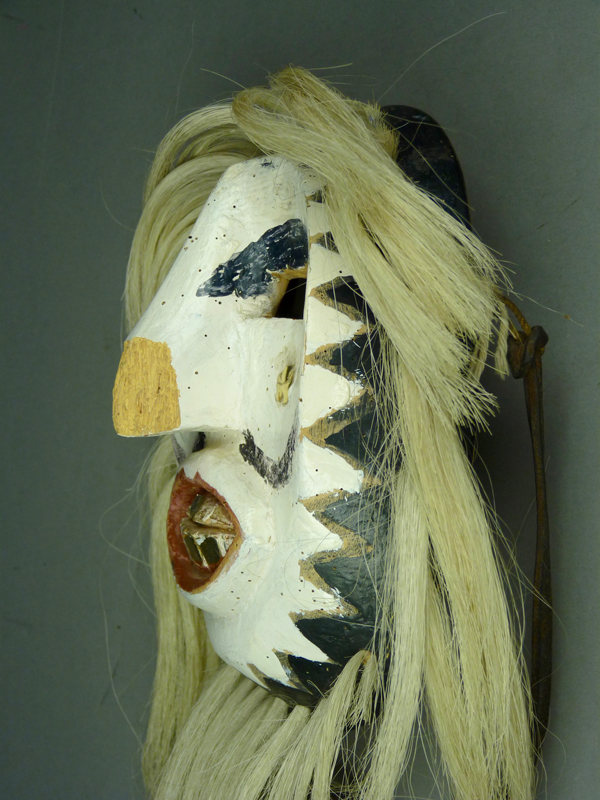 In a series of recent posts I have reviewed the Pascola masks of some of the carvers identified by James Griffith during field work in the Rio Mayo area of Sonora in 1965. There are a number of additional Rio Mayo carvers that were discussed in Griffith’s Masters Thesis of 1967, including Manuel Yocupicio Zamora, Tránsito Duarte, Manuel Bacasewa, Felipe Buitimea, Rosario Jilomeno, Brígido Moroyoki, Escolástico Piña, Domingo Vaípuri, Álvaro Villaneuva, Teodoro Wikosa, Luciano Angwamea, Lupe Montañez, Pedro Osimea, Ancencio Valenzuela. Santos Valenzuela, Andres Wokovatchi, and Guillermo Yocupicio. I invite you to look at the mask photos and supporting information that Griffith provided, which you can survey once again using the link that follows. I particularly call your attention to a mask by Andres Wokovatchi (M3 on p. 48a), and another by Acencio Valenzuela (M1, p. 49a), which are classic examples of the Pascola masks that were made on the Rio Mayo in the 1920s. These are rare and wonderful. Here is the link. 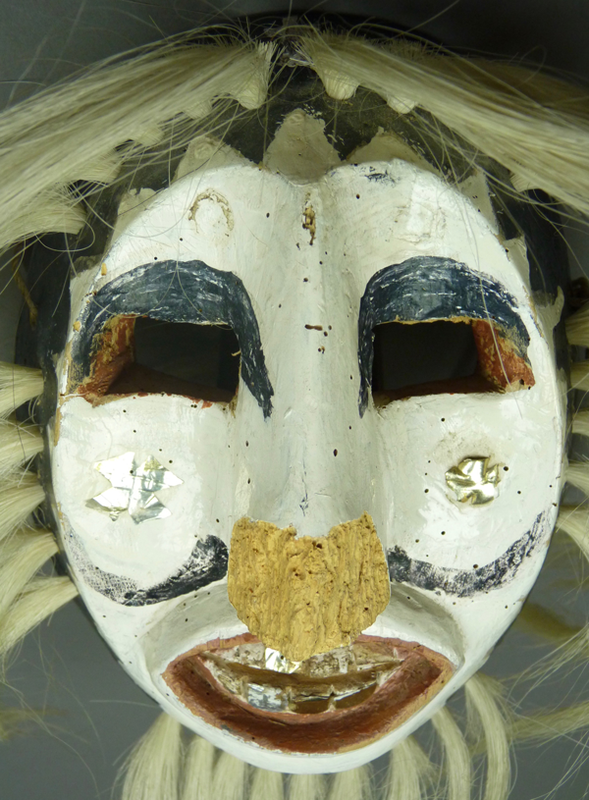 Today, in a final post related to the carvers featured in Griffith’s Masters Thesis, I will draw your attention to a photograph in the Masters Thesis of a mask that was carved by Manuel Yocupicio Zamora (M26, p. 48d, Arizona State Museum #2005-86-3). You can find this photo in the link just provided or in the one that follows. Griffith wrote of this mask that “the face is scooped out, rather than flat or convex” (page between pp. 47 and 48). This was apparently the only mask in the sample that demonstrated such scooping. 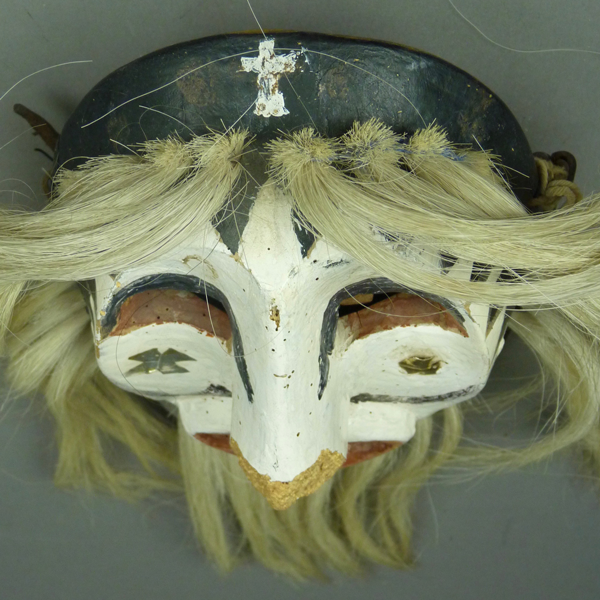 I was interested to learn more about this mask, because I had an anonymous Rio Mayo mask in my collection that could also be described as “scooped out.” Could I use this attribute to identify Manuel as the probable carver of my anonymous mask? To make a long story short, the answer is “No.” My mask was scooped in a dramatically different fashion than the one by Manuel that was collected by James Griffith. I have examined the M26 mask at the Arizona State Museum in Tucson, and the “scooped” carving does indeed set it off from most of the Rio Mayo masks that we have seen. 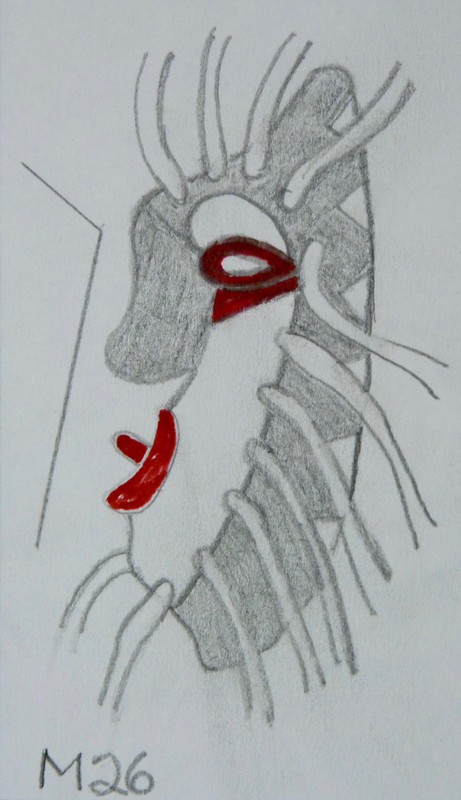 Here is a drawing of Manuel’s mask from the side view, to better demonstrate Griffith’s use of “scooped out”. One might call this a sunken face, because it is creased at eye level so that, when viewed from the front, the plain of the lower part slopes away from the viewer as it rises to the eyes, and then the space over the eyes juts forward. This is an unusual way to depict the human face. The bent line to the left of the face is meant to characterize the relationship between the two planes of the face. With this additional view in mind, you might like to flip back to the frontal photograph on the Internet link, and look again at M26 from this new perspective. While you are there, notice that the second mask from the left, in the line of photos above M26, is M1 (Arizona State Museum #2005-86-1), the 1920s Rio Mayo mask by Acencio Valenzuela, and that this mask does have a similarly folded face. Manuel has apparently made his mask in an older style. Now here is my mystery mask. As you will see, the scooping out of the face on this Mayo mask is of an entirely different nature. Instead of a horizontal crease at eye level, this mask has vertical “gutters” that run down the cheeks. This too is a very unusual way to depict the human face. The surface of the end of the nose is damaged, probably by boring insects. There is a traditional Christian cross painted on the forehead. From above one has a pretty good view of these gutters, which run down below the eyes to the snout around the mouth. The cheeks are literally concave. The vision openings are rectangular. The lower edges of these openings are distorted by the concave surfaces of the cheeks. There are pasted on foil crosses on the cheeks, m/l in the middle of these gutters. The teeth are also decorated with foil. These foil additions are probably later enhancements. The view from below again emphasizes these hollow cheeks or vertical gutters. This mouth might be described as tubular. Also note how deeply the triangles of the rim design extend from the rim. 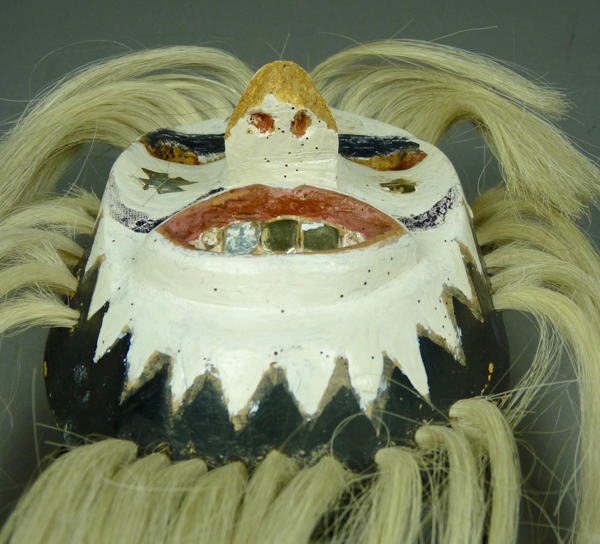 The mask is 7½ inches tall, 5½ inches wide, and 3 inches deep. 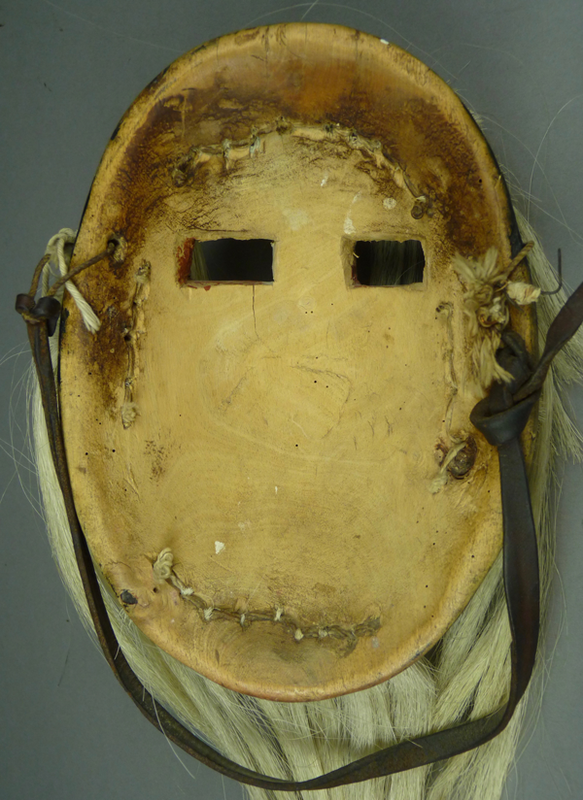 The back of this mask is heavily stained around the rim. Other areas are so pale that I wonder whether they were scrubbed. I hope that you have enjoyed this discussion of unusual shaping of the face that I discovered on two Rio Mayo masks. 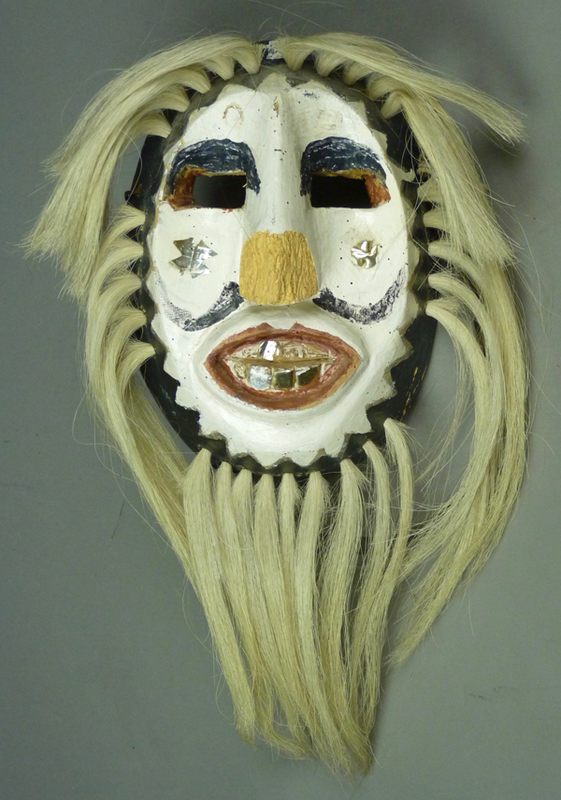 Next week I will continue to show Rio Mayo masks by unattributed carvers.